Linking up with Leann for Monday Morning Gossip. Today, I'm gossiping about Wahlburgers. A burger restaurant owned by the Wahlberg Family which happens to include two actors. You may have heard of them, Donnie and Mark Wahlberg. JenniSixx and I went there last weekend for lunch. JenniSixx playing with her menu. Wahlburgers (a play on the name Wahlberg) has to sides, one side is counter service and the other side is table service and a full service bar. JenniSixx and I choose to have table service. JenniSixx was super excited! We got there around 2:15 and expected there to be a wait, but to her delight, they seated us right away. As soon as we sat down, our waitress ran over, introduced herself, and gave us the menu’s. Earlier in the week, I had already looked at it, and was still unsure of what I wanted. I got the BBQ Chicken Salad and JenniSixx got The thanksgiving burger. JenniSiix thought The Thanksgiving burger was probably one of the best “burgers” she had ever eaten. It’s ground turkey, with stuffing, squash, homemade cranberry sauce, and mayo. She cannot stop raving about it! It was THAT good! We also got a side of fries and onion strings. Normally we aren't fans of onion strings, but holy cow, these were just so incredible!! The French fries were yummy too. Would we go to Wahlburgers again!? Of course, we would! We both want to try their regular burgers, especially the bacon burger!! 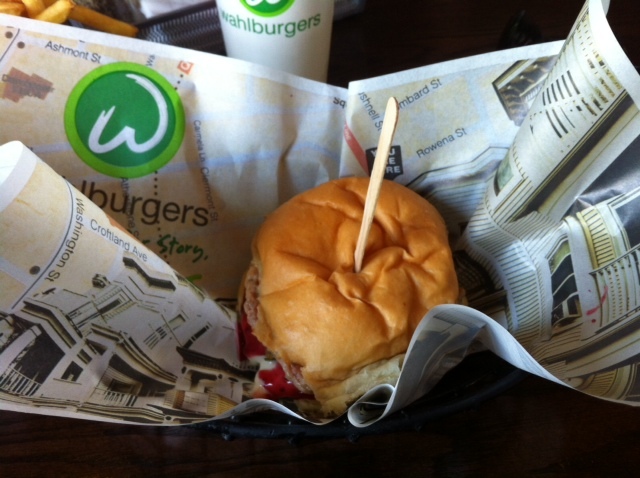 To learn more, visit Wahlburgers. Much thanks to Leeann for letting me link up for Monday Morning Gossip!! Check out her blog Join the Gossip, it's one daily reads!! Let us know, we love hearing from you! It really was DELISH!! I can't wait to go back! P.S. I have a giveaway on my blog right now...(and 3 more in the next few weeks!) Hope you'll check it out and enter! It sounds awesome! I think it's really cool that there are two different dining options. And those shoestring fries look amazing! MARKY MARK!!! hahahah! omgosh this is amazing i didn't know they owned burger joint! holy crap thanksgiving burger sounds insane!!!!! and those onion strings look so yum!! Didn't know about this place! Those fries look really good!